Engine 103, the Eagle River Fire Protection District's new fire truck, is a Pierce Aero XT PUC custom 4-by-4 pumper and weighs in at a hefty 48,500 pounds. 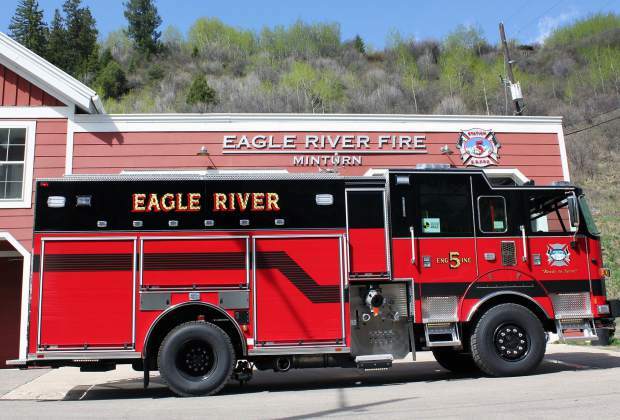 MINTURN — On Thursday, May 10, Eagle River Fire Protection District took delivery of the new fire engine that will be based at the Minturn Station. Crews are currently working on transferring equipment and conducting final checks prior to placing it into service. Engine 103 is a Pierce Aero XT PUC custom 4-by-4 pumper and weighs in at a hefty 48,500 pounds. The engine features an upgraded lighting package for added visibility and multiple airbags to increase firefighter safety in the event of an accident or rollover. It was outfitted with additional technical rescue equipment, including more ropes and stabilization tools for vehicle extrication, a call type that occurs fairly frequently, especially along U.S. Highway 24. It also has a booster line for wildland firefighting, in addition to the traditional 500-gallon water tank, 1,500 gallons per minute pump and Husky 3 foam system. An internal Eagle River Fire Protection District apparatus group, made up of firefighters at all levels, is tasked with designing and quality-checking each rig before it goes into service. Each engine is designed with certain customizations needed for the station it will respond from; in the case of the Station 5 engine, the four-wheel-drive option was a necessity for navigating the steep and narrow roadways of Minturn and Red Cliff. The District also intentionally designs compartment space to remain similar throughout the fleet, allowing any member from any engine to quickly locate a piece of equipment that may be needed on an incident. A formal public ceremony will be held when the engine is officially placed in service and begins responding to calls. More information will be released as it becomes available.